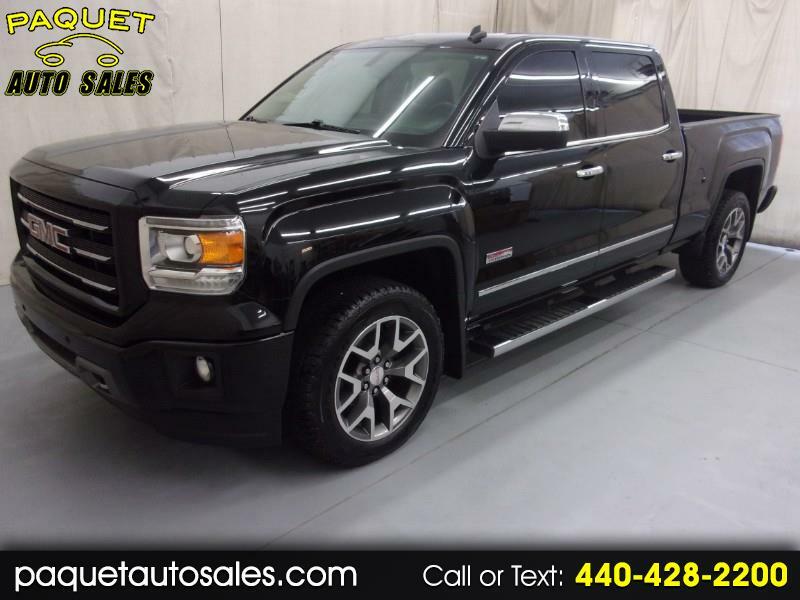 VOICE COMMAND NAVIGATION---ALL TERRAIN PACKAGE---FOUR WHEEL DRIVE---LEATHER AND SUNROOF---REMOTE START---BACKUP CAMERA---ON-STAR AND HANDSFREE PHONE CAPABLE---BLUETOOTH---5.3 LITER V8 ENGINE--- 2014 GMC SIERRA 1500 ALL TERRAIN SLT CREW CAB 4-door in a black exterior finish with 20" alloy wheels, like new Goodyear tires, GM bedliner, bed rail covers, black fender flares and splashguards, front and rear parking sensors, power sliding rear window, body color bumpers, fog lamps, chrome front tow hooks, black grill with chrome accent, chrome body moldings and tube-style running boards, automatic headlights, traction control, chrome door handles and power folding exterior mirrors with turn signals, tinted windows, garage door remote, trailer tow package with hitch and electric brake controller, keyless entry with multi-function remote. Inside you will find a fully loaded black leather interior featuring powered and heated front bucket seats with headrests, center storage/armrest/beverage console, power windows, door locks and exterior mirrors, power adjustable pedals, heated tilt steering wheel with stereo, cruise, voice, phone and vehicle information display, tachometer, digital clock, compass, external temperature, vehicle information, climate display, overhead sunglass holder with reading lights, dual lit vanity mirrors, air conditioning with dual climate control, A/C, 12 volt and USB charging outlets, BOSE touchscreen CD/Satellite ready media player with Navigation, Bluetooth, Handsfree Phone, SD card, aux. and USB inputs, folding split rear bench seat with headrests, folding rear center armrest/beverage holder, rear window defroster, carpet floor mat set. Fully inspected by our service technician. Detailed inside and out and ready for delivery. Stop in or call today and speak with one of our friendly sales staff with any questions that you may have.